Please note, if you wish to order a copy of this extraordinary publication, and to donate to our mission and activities, we invite you to make your selection among the options for Contributions & Donations. 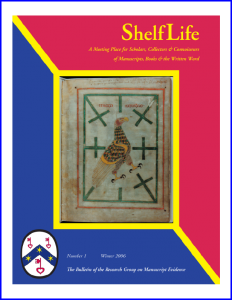 ShelfLife (ISSN 1528-7971), the Bulletin of the Research Group on Manuscript Evidence, is a new publication in the field of manuscript and related studies. The journal is the only one of its kind, focusing on manuscripts of all periods, with an interdisciplinary approach. Moreover, it considers not only manuscripts, but also textual materials in many other forms and formats, from tablets and scrolls, and from architectural sculptures and stained glass, to printed books and electronic media. Our illustrated Bulletin arose out of the desire of volunteers of the Research Group to provide a forum to discuss all the aspects of manuscript study in one place, to consider these aspects in their wider contexts, and to illustrate their features, above all in color. The Research Group is not narrowly defined by a single academic discipline, such as art history or literary analysis. 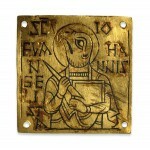 Rather, we are dedicated to all aspects and attributes of manuscripts, and we strive through our publications, seminars, conferences sessions, and other meetings to foster dialogue between teachers, scholars, and students of all relevant disciplines and historical periods, and between the world of scholarship and the wider world. 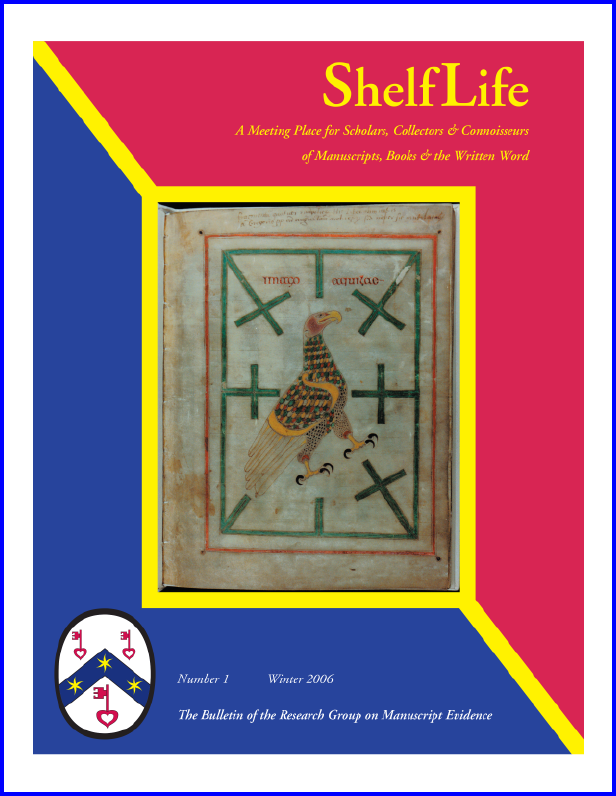 ShelfLife is designed, as stated in its subtitle, as “A Meeting Place for Scholars, Collectors & Connoisseurs of Manuscripts, Books & the Written Word.” It may consider materials in the wide range of fields which this objective encompasses. Given the patterns of transmission of the written word in various media, and the challenges of studying, collecting, conserving, and preserving written records, this range may extend across many periods, regions, languages, and cultures. Although our research and publication activities so far have often focused upon the transmission of written materials from Late Antiquity to the Early Modern Period in Europe, the British Isles, and beyond, our approach in ShelfLife welcomes other areas as well. ShelfLife is edited by Mildred Budny, our Editor-in-Chief of Publications, and Asa Simon Mittman, our Editor-in-Chief of ShelfLife. Each issue will be in full color, with feature articles and notices, as well as some regular columns. The regular columns aim to include “Hidden Treasures” (descriptions of under-studied manuscripts in North American or other collections), “Exhibitions & Catalogues” (new displays of materials from specific collections or on particular themes), “Notes from the Field” (current research and ongoing projects), profiles of Research Group Officers and Associates, reports of Research Group sessions and conferences, notices of new books, and reviews of new or useful resources on the web (such as websites or listservs) dealing with manuscripts and related subjects. Our “Cover Story” casts the spotlight on the image displayed on the cover of our issue or on images displaying “covers” of some kind(s), and reports the context, reasoning, and inspiration that governed the choices therein. Whether considering our own or others’ productions, this feature takes inspiration from the behind-the-scenes interviews with cast members, directors, designers, screen-writers, and other collaborators, which greatly illuminate the choices underlying feature presentations of collaborative works on screen, on stage, in print, and in other media. In each issue of ShelfLife we will, as they wish, list the names of “Sponsors & Benefactors” who, as individuals and as institutions, generously contribute funding to support the publication of ShelfLife and the other work of the Research Group, including the quest for its endowment. The first, celebratory, issue gives the opportunity to record our thanks in print to the Donors, Sponsors, and Benefactors who have supported the preparations for this issue as well as for launching this series. The first issue (Number 1 for Winter 2006) is now available. It extends to fifty-six pages, all in color and extensively illustrated. It contains a “Welcome to ShelfLife” by its Editor-in-Chief, an account of the “Origins, Aims, and Outlook” of the Research Group by its Director, and the formal publication of the Research Group “Style Manifesto,” which sets out the principles of design, typography, and layout of our publications. 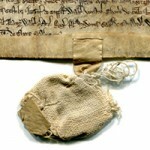 The presentation of the Bulletin itself is intended to exemplify the practice of these principles, which take much guidance from our dedicated study of approaches to the presentation of the page, with text and image, and with text as image, across the centuries of improvisation, creativity, and inspiration, whether in manuscript, in print, or on screen. 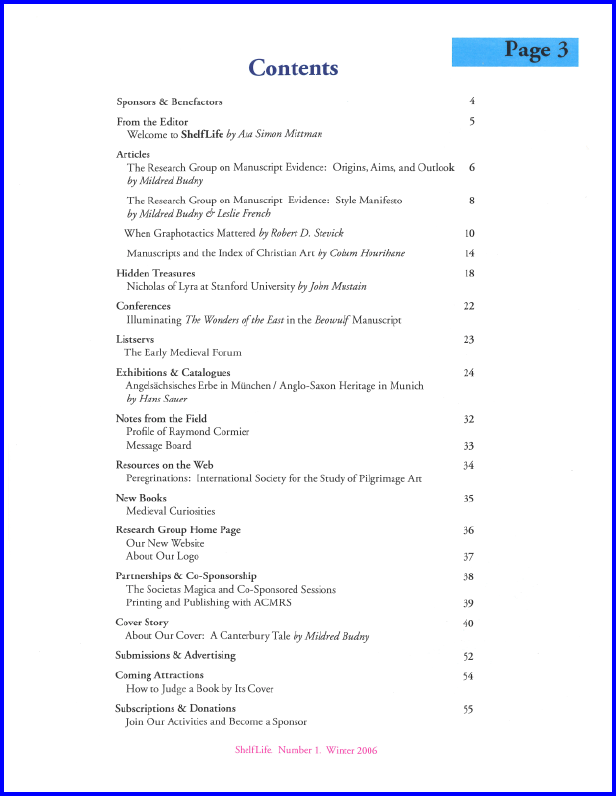 Other feature articles in this first issue report on “When Graphotactics Mattered,” by Robert D. Stevick, and “Manuscripts and the Index of Christian Art,” by Colum Hourihane, Director of the Index, based at Princeton University. 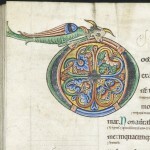 The first article considers the approaches which Anglo-Saxon scribes adopted when writing their Old English vernacular, whether in prose or in poetry, as in the renowned “Beowulf Manuscript.” The second offers an expert account of a major research resource for the study of images, in manuscripts and other media, from many centuries and cultural contexts in the Christian era. Our column on “Hidden Treasures” casts light on a fifteenth-century German manuscript (with chained binding) of “Nicholas of Lyra at Stanford,” by John Mustain, Rare Books Librarian at Stanford University. Hans Sauer describes the approach of the exhibition and companion catalogue, which he edited, on the “Anglo-Saxon Heritage at Munich,” showcasing the remarkable collection of Anglo-Saxon and related materials in the Bavarian State Library in Munich. Our report of “New Books” highlights the first book by our Editor-in-Chief and an equally ground-breaking book on the subject of textual amulets (materials bearing protective texts to be worn or carried) by Don C. Skemer of Princeton University. The “Cover Story” by Mildred Budny describes and illustrates “A Canterbury Tale” explaining the choice of illustration for our front cover, a beautiful eighth-century frontispiece with a sixteenth-century collector’s authenticating inscription. This report examines the traditions of collecting manuscripts by archbishops of Canterbury, from Augustine under Gregory the Great to Matthew Parker under Elizabeth I. It takes a close look at the report of Augustine’s purported books by Thomas of Elmham, monk of St. Augustine’s Abbey, Canterbury, in the early fifteenth century. Our tale recounts the results of long-term work of the Research Group on manuscripts collected at Canterbury across many centuries, and publishes the results of fresh research in the field. All these, and other, elements in the issue are illustrated with images from manuscripts and other media containing text and image. Some are reproduced for the first time, or for the first time in color. The “Contents” are listed here: ShelfLife. The issue is printed and distributed by the Arizona Center for Medieval and Renaissance Studies (ACMRS), Tempe, Arizona. Information about the Center and its publications appears on its website, which we invite you to visit: http://www.asu.edu/clas/acmrs/. We thank our Contributors, Subscribers, Sponsors, and Benefactors, who have responded to our call before publication. As announced in our circulars and on this website, the rates for purchase and subscription, following our pre-publication offers, have now risen. Issue 1 is now available. We hope that you will enjoy its pages, presentation, and contents. We welcome purchases and subscriptions for this issue, as well as purchases, subscriptions, donations, and sponsorship for the next issue, future issues, and the series overall. We hope to welcome you among our subscribing Donors, Sponsors, and Readers. Please see our forms for Contributions & Donations. Update 2016. So far only Issue 1 has appeared, because the otherwise-contracted and supposedly secured distribution of ShelfLife fell to Mildred Budny almost right away. The refusal to fulfill the contracted expectations maybe was a male thing. Whatever the causes, the enforced condition took much time and energy from our Director over several years, as she had to endeavor both to arrange the circulation for the first issue and any hope for future subscriptions, as well as to seek a replacement printer/distributor in order to complete that first issue’s distribution and advance to any others. A sad predicament for so beautiful an issue. The Bulletin had been intended as our principal vehicle for fund-raising. We needed such help. The plan was to find subscriptions for the series of issues, and continuing sponsorship for individual issues and advertisements within them. 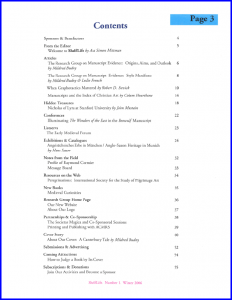 The several troubles with quality-control and shipping for Issue 1, and the disappointments with arranging for alternate suppliers in the face of that gap drained much energy, time, and momentum from both the ShelfLife enterprise, which turned into a lonely premise, and other activities of the Research Group on Manuscript Evidence — essential fund-raising included. No wonder our Director fell behind in the tasks for some years, and fell ill, to boot. Issue 2 was already nearly ready for publication when Issue 1 was sent to the printer. That condition of readiness had been a requirement of the project, before any Issue 1 could emanate. Thus, its failure to launch has continued to weigh heavily on the sense of responsibility to its contributors, its subscribers, its designers, and others. Perhaps someday, we might describe its intended scope, as the Research Group on Manuscript Evidence continues to salvage and to present afresh on its expanded website some of the projects which had to be abandoned over some years in the face of withdrawn support and/or other heavy challenges. Examples appear in the reports which have emerged steadily in the summer of 2016 for some early Seminars and Workshops on “The Evidence of Manuscripts”. We prepare for more of such salutary work.